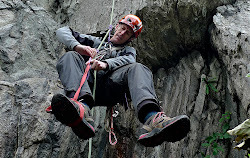 Rock Climbing Problem Solving and rescue systems, north Wales. Rock climbing problem solving. Knowing how deal with certain climbing related problems can be viewed in a similar light to first-aid training where we hope we will never need to put the knowledge into practice. But knowing that you have got the necessary skills can help you feel more confident about tackling challenging routes in adventurous places. Would you know what to do if you abseiled to the foot of a tidal sea-cliff only to find the start of your route too wet to climb and the routes on either side are beyond your grade? Or if you were 2 pitches up a multi-pitch route in the Lake District and your less experienced second has just fallen off a steep bulge and either no longer has the strength to do the move or is unable to get back in contact with the rock? On our rock climbing problem solving course we will start to look at what to do when things go wrong. Before we do though we will have a quick MOT of your climbing, belaying and belay building skills to date. We will look to eliminate any bad habits and ensure you have a safe and solid base to develop from. Many problems arise from bad practice or lack of foresight so looking ahead and asking 'what if' can often prevent problems from even occurring. We will then start with simple scenarios and build to more complex ones as and when you feel ready. Rather than learning numerous complex solutions to different scenarios you will learn a relatively small number of skills which you will use as building blocks to be put together in different ways to solve any specific situation. For the rock climbing problem solving course you should already be comfortable leading to VD or above on multi-pitch routes.